Lets face it we are all a little bit lazy and why do something the hard way when you can get a computer to do it for you. 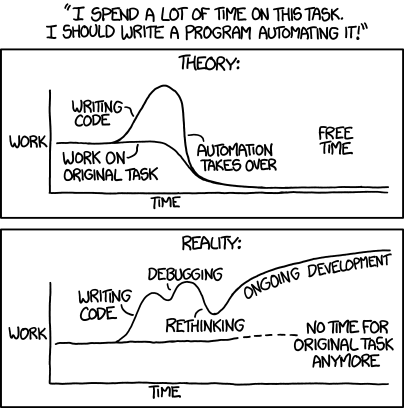 This topic is to share tasks you’ve automated to make your life easier or more efficient, be it in Bash, Python, C, PowerShell, Excel, hell even Redstone, if you’ve automated it I want to see it. I made this script a while ago to convert my music collection to mp3. It takes three arguments either wav, flac, or ogg and converts all files in the current directory to mp3. When I built Linux from Stretch I often needed to detach my usb flash drive to test it but also center the chroot again later so I made this. it takes two arguments m and u, the first mounts everything and enters the chroot and the second unmounts and cleans everything up. Thats it for now, I’ll post new stuff later when I have more to show. Some more scripts I’ve made because why not. pfSense only allows you to automatically backup your router config if you have a gold subscription, so I made this script that logins into the admin panel and retrieves the latest config and downloads it to my desktop using wget. A very long time ago I had issues on ubuntu automatically mounting my NFS connection from my server on bootup using fstab. so I made this script to either run on startup in my rc.local or manaully if I needed to mount it after the system has started. echo "$mount_point is not mounted"
When using the script above I noticed that my compile times were significantly longer than expected as I’m a dummy and I forgot to add the ccache variables. I’ve edited the script to include them. Very simple script I made that pops up an i3 message bar after a specific amount of time. sleep $TIME && exec i3-nagbar -t warning -m "$MESSAGE"
bindsym $mod+F10 exec ~/bin/timer 15m "Your Pizza is ready"
I made a neat little python program that will check for errors. Is mostly due to the fact that im too lazy to just open up a terminal to find any errors myself. Varirous builds for custom docker containers. Contribute to michaellindman/docker-builds development by creating an account on GitHub. I also included my previous docker builds for flarum and tiddilywiki as well because why not. Simple python script I made to change the brightness of my displays using xrandr by increments of .25 depending on which workspace is active (I.E which monitor has focus). cmd = "i3-msg -t get_workspaces | jq '. | select(.focused==true).name'"
One of its main issues of the script above is it relies on me never changing the workspace on my second monitor, while this doesn’t happen often in an event that it does it’ll change the brightness of my primary display even though the second has focus, so to fix this i made a couple of improvements. with 2560 being the width of my display and x the mouse coordinates on that axis. cmd = "xdotool getmouselocation --shell | head -n -3 | sed 's/[^0-9]*//g'"
I plan to improve it further by pulling the display id from xrandr based on the coordinates so nothing is hard-coded but that is for another time and this works well enough for my needs now and is vast improvement over my previous version with the added benefit that this now works without requiring the use of i3. kinda simple one but mother wanted me to print 34 pdf files and when I asked Windows to print them from the file manager it told me i had to open each one and print them individually so transferred them over to Linux and made this small shell script to do it. Probably could’ve found a way todo it on Windows too but I’m far less familiar with batch scripting and this way still saves me a lot of time and effort.